It might be the ultimate holiday – raise anchor on your superyacht and see where the tides take you (in ultimate luxury, we might add). For most of us, this will be fantasy shopping. Perhaps you've just purchased a Euromillions ticket and you're already planing how to spend it. We’ve all got dreams for new houses, a garage full of supercars, more watches than any sane person would deem necessary, and perhaps a couple of family mortgages paid off, if we’re feeling generous. Now dream bigger. Let your imagination run away with itself and into the world of luxury yachts. Whether you're a regular at Port Hercules, you've been saving up for the ultimate experience, or you've just won the Euromillions, these are our favourite yachts to charter in 2018. They start out modest and quickly accelerate into a world where £1 million a week is considered the starting point. We say starting point, because the prices mentioned below generally do not include food, drink or mooring fees. They include fuel for around four hours of cruising per day, however, fuel used by accompanying ‘water toys’ like jet skis, day boats and submarines (yes, submarines) often costs extra. First, let’s be sensible. The Moorings offers a range of yachts to charter all around the world, including in the Mediterranean, South Pacific, Americas and Caribbean. This compact 13 metre yacht sleeps up to 10 - or eight if you require your own skipper and chef. Features include a sun deck and generous outside dining area. Double your budget and this 15.5 metre vessel is what you can expect to charter. It sleeps six passengers in four cabins, has indoor and outdoor dining areas, and offers panoramic views from within. Now let us step things up a gear with the Gladius, a 38.7-metre yacht with space for 12 guests and seven crew. There’s a sundeck with hot tub, bar, TV and space for alfresco dining, plus a range of water sports equipment. Gladius is based in the Western Mediterranean in the summer and the Caribbean during the winter. This 42-metre yacht can accommodate 12 guests in six cabins - plus eight members of crew. Refitted just three years ago with the finest Italian woods, Barents Sea offers two outdoor dining areas and a sundeck with hot tub and illuminated bar. There is also a wide range of water toys, including a 5.4-metre speedboat, two jet skis, inflatables, water skis, and a canoe, plus fishing and snorkeling equipment. Built in 2014 and owned by Formula One pundit and former team owner Eddie Jordan, Blush is a 47-metre yacht with space for 10 guests in five cabins, plus 10 members of crew. Blush is claimed to be the largest and most advanced boat ever built by Sunseeker, and boasts a large outdoor dining and entertainment space. There’s also a hot tub, indoor dining for 10, and a drinks bar on all three decks. Built in 2010, RoMa is 62 metres long and has six double cabins, plus space for 17 crew. RoMa features a gym with massage facilities, swimming pool with current to swim against, a glass lift serving all decks, an onyx bar and dining table - and a 27-metre inflatable water slide which can be deployed from the top deck. If you’re going to give your boat a name like Legend, then it had better be impressive - and this one certainly is. Legend is a fully classified Class-1 ice-breaking ship, which means it is as at home in the Arctic as on the Med. Legend is 77 metres long and sleeps 26 guests in 13 rooms, plus 19 crew. A further 10 members of ‘expedition crew’ are provided for when you want to pretend to be Ranulph Fiennes. When you’re done wrestling polar bears, there’s a cinema, a Balinese spa with sauna and hot tub, swimming pool and a gym. Oh, there’s also a helicopter onboard. And a three-person submarine. You shouldn’t be surprised to hear that both cost extra. This brightly coloured, 69-metre yacht was built in 2003 and has space for a whopping 32 guests in 16 cabins spread across five decks - and 32 members of crew. There are two hot tubs, a spa with massage services, an outdoor cinema, a casino table and, somehow, a golf driving range. Water toys include a 6.4-metre, 260 horsepower speedboat, a 5.4-metre speedboat, two jet skis, wakeboards and surfboards - and biodegradable golf balls for driving into the sea. 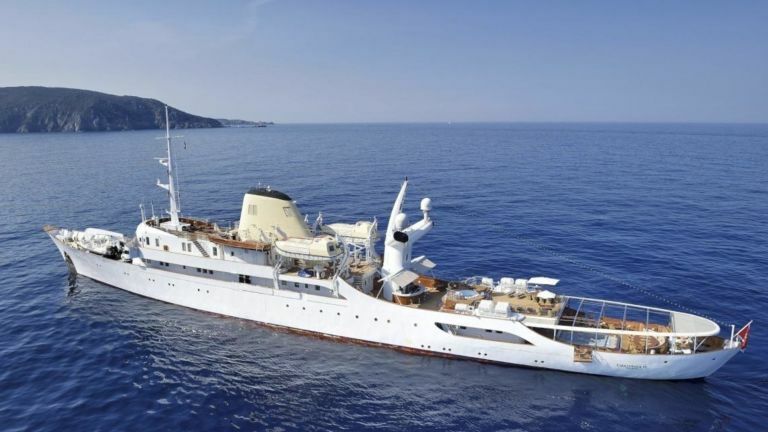 Built during World War II then converted into a private yacht in 1954, Christina O was most recently refitted in 2017. This boat offers accommodation for 34 guests in 17 cabins, plus space for 38 members of crew. Christina O measures 99 metres long and offers a bronze-edged swimming pool which can be drained raised to be used as a dancefloor. There is a lounge and bar with Steinway grand piano, a spa, catering from a Michelin-starred chef, and a fleet of three mahogany tender craft, plus jet skis, snorkeling equipment and a six-person banana boat. Guests to have sailed on Christina O include Marilyn Monroe, Frank Sinatra, John F Kennedy and Winston Churchill. It isn’t clear if any of them rode on the banana boat. This 75-metre vessel was built in 2008 and refitted in 2013. It has accommodation for 12 guests in six cabins, plus no fewer than 20 members of crew. Available in the Western Mediterranean, Anastasia has a cinema, gym with massage and medical rooms, a 30-metre long nightclub, four smaller boats and four jet skis. The name says it all. This 88.5-metre yacht was built in 2012 and offers six double cabins plus 27 crew. There’s a 7.5-metre swimming pool with counterflow system, so you can swim against the flow without reaching the end, and - rather uniquely - an exotic reptile house separating the bar and dining area. A silver-engraved lift serves all four decks, while half of the upper deck can be made completely private from the rest of the yacht. Here, there is a hot tub, private sunbathing area and dining facilities. Elsewhere, there is a three metre plunge pool, a helipad, cinema, two 11-metre day boats and no fewer than 10 jet skis. Savannah sleeps 12 guests in six cabins and among her 24 crew you will find a masseuse and beautician. Built in 2015, Savannah is a hybrid powered by a diesel generator and electric motor, making it quieter and more fuel efficient than other yachts. There’s a nine-metre swimming pool, sun deck with DJ station and barbecue, a gyn, a spa, a lift serving all decks, and an underwater observation lounge, featuring windows which offer views both above and below the water. Yes, because we’re sure you were thinking it too, you can spend over £1m a week charting a yacht - and remember, food, drink and mooring fees are often not included. Here Comes The Sun is 83 metres long and offers 10 cabins for 12 guests who are looked after by a crew of 24. This yacht has five decks served by a lift, a cinema, hot tub, large infinity pool, spa facilities with sauna and steam room, and a self-playing grand piano. Water toys include two 11-metre day boats.